Greetings all – Please allow me to introduce myself. My name is Greg McCarthy and I am a senior Marketing major at the University of Massachusetts Dartmouth. Over the last 3 years at school, I have developed a deep interest in not only marketing, but also in sustainability, specifically seeing the ways it is implemented in business. Today, I have the privilege of getting to write a guest post for Ben Grossman’s “Sustainable Ink” blog on BBMG’s latest white paper Disrupt & Delight, which focuses on implementing “Sustainable Brand Innovation” in 5 principles. I connected with Ben after his presentation on a panel at the 3rd Annual Sustainable Economy Conference in Boston in April, and recently started working for his firm, Grossman Marketing Group, as a Summer Associate Marketing Intern. Ben has mentioned BBMG in the past on this blog as a firm based in Brooklyn, New York, that has been a leader in sustainability for many years. To download the full white paper, please click here and then follow the prompts. BBMG’s five principles describe real world examples about how we can get the wheel turning towards addressing major environmental issues in the business world. The white paper’s first principle, “Start with what’s Sacred,” explains how in order to address economic and environmental threats and maintain a commitment to sustainability, the approach to innovation “must begin not just with the technical marvels of polymers and solvents, but the values, hopes and aspirations of our shared humanity.” The principle features Chipotle’s recent advertising efforts to grow more organic ingredients and provide customers with healthier food. Please find the video below. Principle 2, “Design Holistically” describes innovation as being “interconnected.” BBMG believes sustainable brand innovation needs a “holistic approach” especially within business, and that product and service design must occur in an ecosystem that reinforces the health, sustainability and success of each part over time. 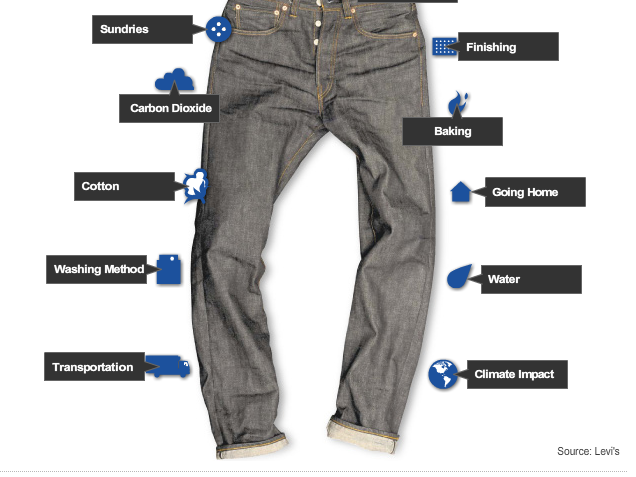 Levi’s Water<Less jeans are highlighted in this principle by describing their stylish design that also use less water in the production process. The third principle, “Create Collaboratively,” transitions smoothly off the message that principle 2 sets, and discusses open innovation platforms, industry coalitions, and community-driven platforms as examples of collaboration that are helping to drive change. I particularly found interesting the example they used on Unilever’s Open Innovation, which describes how Unilever started an online platform for outside experts to contribute to the idea of “doubling the size of its business while reducing the size of its environmental impact.” For a link to read more about this online platform, please click here. The fifth and final principle, “Disrupt and Delight,” uses Nike as a focal point behind its message that consumers want good products and expect them to be responsibly produced. Some terrific quotes by Hannah Jones, the vice president of sustainable business and innovation at Nike, are featured: “What we have to do with sustainability is to make today’s status quo obsolete so that it just becomes the norm and default option because it’s better, easier and frankly more delightful to the consumer.” Jones also talks about how to “never compromise performance and price for sustainability or you will do a disservice to sustainability.” Here’s an excellent Q&A with Jones on GreenBiz. Overall, – I thought BBMG demonstrated a strong connection when linking Sustainable Brand Innovation to the current issues our planet is facing. When combining the principles together, BBMG believes they can create new ways “to do much more with much less.” I strongly support this notion, and urge others to draw their attention to these topics. I had the privilege of guest lecturing at Tufts University in late February to a class titled “Social Marketing.” I focused my presentation on green marketing and sustainability, with a particular emphasis on the importance of transparency. In addition, I spent some time on product lifecycle management, which I’ve been interested in for a while, and have been learning a lot more about through my membership on the Product Stewardship Institute Advisory Council. During the conversation, I covered a number of topics that we have reviewed here at Sustainable Ink, the most important being the issue of transparency. As we have been advocating for years, when companies make green claims, they need to back those claims up with hard data. In the commercial printing world, a great example is the Environmental Defense Fund Paper Calculator, which I covered here back in 2007. I provided a best practice example, which I wrote about in July 2009, about the use of eco-logos and statistics on the outside envelope of a fundraising appeal by the Democratic Senatorial Campaign Committee, which was signed by former Vice President Al Gore. The next part of the discussion focused on product lifecycle management and the importance of reducing the use of resources in packaging. To create these slides, I was lucky to get help from Scott Cassel, the founder and CEO of Product Stewardship Institute. The example I provided was Staples, and its pioneering computer “take back” program, which, according to the company, allows consumers to “securely recycle your end-of-life technology.” These programs prevent a large number of devices from being thrown away, reducing the presence of hazardous materials in the waste stream. Staples was the first major retailer to offer such a program, and it had a significant impact on its industry; Best Buy, Office Depot and a range of other firms have followed suit. Not only is this good for the environment, and convenient for consumers, but it has been good for Staples as well – studies have shown that this program increased consumer loyalty to the chain. I closed out the formal part of the program with a discussion about packaging, and how reducing the resources needed to make products can have a significant impact on a company’s brand. Over the last decade, Wal-Mart, the leading retailer in the world, has suffered a number of public relations issues, with many focused on its treatment of workers. In addition, very few retailers have had a more significant positive environmental impact on their industry or suppliers than Wal-Mart. There is a wide array of information on Wal-Mart’s sustainability efforts on its website, including its creation of a Sustainability Index, its efforts to create zero waste, as well as its aggressive efforts to reduce energy use and greenhouse gas emissions. I focused the conversation on one example of Wal-Mart exerting its influence on a supplier to effect significant change in its industry. The supplier was Tide, and the result was a packaging revolution. Several years ago, Wal-Mart set a goal of only selling concentrated liquid laundry detergent in all of its U.S. and Canadian stores. The program was a success, and the entire industry has been transformed. In addition, because of this and a number of other initiatives, consumers have easier access to more environmentally-friendly products, and Wal-Mart’s reputation has been partially rehabilitated. The students, all of whom are undergraduate students at Tufts University, had a wide range of interesting and insightful questions and comments. I was honored to have had the opportunity to spend the evening with them! The book supplies busy executives and research teams with a collection of charts presenting environmental, sustainability and energy-related data on a quarterly basis. Our goal is to make the job of gathering essential information and metrics a bit easier for corporate decision-makers. Data topics include Energy, Facilities, Sustainability & Strategy, Management Systems & Reporting, Carbon Costs & Markets, Marketing & Public Opinion, Transportation & Supply Chain, Emissions and Waste & Recycling. Here’s a link to the download form. Enjoy! Award-winning green entrepreneur, Ben Grossman of Grossman Marketing, talks about how to develop a sustainable direct marketing campaign and what it takes to transform a fourth-generation business into one with a strong environmental focus. What was your inspiration for starting Sustainable Ink? When and how did you get started? I started my blog, Sustainable Ink, in 2007. I had joined my fourth-generation family business, Grossman Marketing Group, the previous year and was often thinking about sustainability and green business issues. Our business was founded in 1910 as Massachusetts Envelope Company, and it’s evolved into an integrated marketing services firm. Today, our main service lines are a design studio, envelopes and direct mail services, printing of all kinds, and promotional products. In addition, we have a fast-growing e-commerce and rewards and incentives business. As oil prices were rising, and global warming had gone from a fad to stated fact, I saw the writing on the wall – that we live in a world with finite resources, and consumers are increasingly interested in companies’ environmental footprint, commitment to environmental causes, and the sustainability of their products. I wanted to start a blog through which I could discuss these issues, with an emphasis on marketing services and my industry. I have been very proud to see the site’s readership grow over time, and have some of my posts picked up by national green news sources, most recently Environmental Leader and Ecopreneurist. I launched our firm’s green marketing and sustainability practice the previous year with the goal of working with my team to help clients identify environmentally-conscious business practices as a way to differentiate them from their competition and establish a competitive advantage in their respective fields. For this work I was the 2009 recipient of the New England Direct Marketing Association Prodigy Award. The Prodigy Award is given to one marketing professional each year in New England under the age of 30 who has added the most to the art and science of direct marketing in the prior year. Is interest in sustainable marketing growing or declining? Green marketing is definitely not out, but consumers have been inundated with an array of green logos, claims and messages, and they are becoming increasingly skeptical of the green claims they read and hear. Much of the research I have seen, as well as my own experience, point to the need for transparency in green marketing claims. People want to know not only how a product is green, but according to whom. The third-party reference needs to be a legitimate one – not an unknown group with a confusing website. In the print world, the best example of a strong and respected third-party authority is the Environmental Defense Paper Calculator. On this site, people can calculate the savings derived from using papers with post-consumer recycled content. These savings include energy, wastewater, trees, etc. I like this because it’s a resource that is industry independent. Although I respect the savings calculators put together by paper companies, using a third-party resource rings truer to consumers. How do you help your clients target and reach green consumers? There is a wide range of ways to target and reach green consumers. They include buying ads on websites that cater to these consumers, as well as on-the-ground outreach at community events. In addition, using sophisticated direct mail techniques, the right brand can reach the right people with useful, actionable direct mail. How do you help businesses communicate their green-ness to their customers? The most important advice I can give to companies is to tell the truth and be transparent in their claims. Companies get in trouble by greenwashing – when they mislead consumers about their environmental practices or the environmental benefits of a product, and consumers are getting fed up. As I mentioned earlier, when making a claim, try to use a respected third-party resource to verify it. How do you find your customers? The best customers come by referral, but we also find them through speaking engagements, direct mail, networking, social media and online ads. We believe the best campaigns are integrated ones, and we try to practice what we preach! What are consumers looking for in a green company? What messages do they want to hear? Consumers are looking for green products to be made from renewable resources, use recycled content, or with less materials than in the past. For service providers, consumers are looking for consistency. For example, if a hotel claims to be green because of an array of practices, it is somewhat of a contradiction when there are no easy ways to recycle plastic bottles, cans, paper, etc. I have seen this too often when traveling on business, and I wish some hotels would give greater consideration to waste management practices. Does sustainable marketing typically cost more money? Sustainable marketing shouldn’t necessarily cost more money. In the print business, people can generally use recycled papers, vegetable-based inks and renewable energy in the production process for no extra cost. There are of course premium eco-friendly papers that add cost (New Leaf, Mohawk Options, Neenah Environment, to name a few), but if a marketing professional is working with the right vendor partners, they should be able to reduce their footprint without adding much cost. What recommendations do you have for businesses to green their marketing without breaking the bank? As I mentioned earlier, people can use vegetable-based inks, renewable energy and recycled materials for little or no extra cost. Some practices can cut costs – like considering the production of an item during the design stage, so it gets optimized for printing to use the least amount of paper. In addition, when people manage their mailing lists well, they mail fewer pieces to a better audience, thus cutting postage and printing costs. Are all your marketing services eco-friendly? How is your business greener than your competitors? 1) All metal printing plates are collected after use and given to a recycling company. 2) All press solvents and washes are low VOC (volatile organic compound) formulas that minimize impact on the environment as they contain no acetones. 3) All non-metallic inks are vegetable-based (i.e. non-petroleum based). The ink contains approximately 35% oil, all of which is vegetable-based (soy and linseed). 4) Our inks are made from a “stay open” formula – meaning that the top layer does not skim over and form an unusable layer – this reduces ink use by about 10% annually. 5) All waste ink is sent to a recycler where it is mixed with other waste to form a low-grade heating oil. 6) All paper waste and cardboard packaging are sent to a paper recycling company. 7) Our prepress system is entirely chemical free – only water is used to rinse the plate after imaging. 8) All waste oil is recycled with an oil recovery service. 9) All wood pallets are returned to our paper merchants for re-use. 10) In addition, here’s a blog post I wrote about recycling, in which I explain that we allow our employees to bring in batteries, CFLs, fluorescent tube bulbs and paint from home to be recycled by a partner of ours. We recently added a Big Green Box to our office so our colleagues can bring in electrical waste from home as well. What kinds of mistakes do green businesses generally make that you would advise against? The worst mistake is to not tell the truth or to make misleading statements and we strongly advise against them. In addition, we make sure that green marketing underpins an organization’s overall commitment to sustainable practices. If they are just surface changes, consumers will see through them. In addition, employees want to work for socially responsible organizations. What mistakes have you made as a green entrepreneur and what advice would you give others looking to start a green business? Sometimes I have had the tendency to try to make a product or offering perfect before rolling it out. One piece of advice I would have is to “beta” test everything, as early customer feedback will always help you improve. You can get in touch with Ben through Twitter. Despite widespread support for sustainability reforms, lofty rhetoric from CEOs and government incentivizes for businesses to “go green,” corporate sustainability improvements have been limited. To further probe why companies are not moving more aggressively on this front, Deloitte recently published a study that delineates corporate perspectives on sustainability based on responses from 48 companies across different industries. The report studies these perspectives in five contexts: general sustainable practices, sustainability related to innovation, corporate responses to sustainability incentives in the stimulus package, the relevance of new skills in pursuing sustainability efforts, and future sustainability trends. Several compelling trends emerged from this study which I thought would be worth sharing with the Sustainable Ink community. First, it is interesting to note the challenge companies face trying to innovate through sustainability. The study found that in the area of product innovation, 23% of companies surveyed were developing entire sustainable product lines while only 25% of all companies surveyed indicated they were pursuing efforts to make their products more sustainable. So while a considerable portion of companies are devoting entire lines to greening efforts, only a fourth of all surveyed incorporate the sustainability factor into innovation. A major problem companies identify when trying to create sustainable products is the tension between willingness to pay and cost. Even though customers may want sustainable products, they are not necessarily willing to pay more for them, so companies must find ways of keeping the sustainable measures cost-neutral. Another interesting finding from this report is the corporate reaction to sustainability incentives in the stimulus package enacted last year. While there was an overall mild recognition of energy efficiency incentives in the legislation (5.29 on 10-point scale, with 1 being not at all familiar and 10 being very familiar), there was the largest gap in understanding between the automotive industry, 6.38, and the technology industry, 3.91. The gap in policy awareness between the industries supports the broader idea that there is a heightened emphasis on greening in the automotive industry, where carmakers have been under considerable scrutiny and consumers have a relatively high willingness to pay for a hybrid vehicle, compared to a willingness to buy energy efficient technology products. Overall, this report offers strong insights into corporate perspectives and decision making criteria in the context of proposed sustainability reforms. Sustainability advocates and policymakers must continue to consider the needs of corporations who are open to pursuing stronger sustainability standards but whose aims continue to be maximizing shareholder value and maintaining profitability. Click here to download the full report from Deloitte. We have written often at Sustainable Ink about the importance of transparency, as well as the need to account for the environmental impact throughout a product’s lifecycle. With that in mind, we are pleased to see a positive step taken by some well-known corporations. At next month’s Outdoor Retailer trade show in Salt Lake City, retailers will receive a new tool to help them pursue their sustainability goals. A group of about 100 retailers and manufacturers, including Nike, Levi Strauss, and Target, have joined forces to develop software that makers of apparel and shoes can use to measure the environmental impact of their products and assign to each an “eco-value” similar to the Energy Star rating of appliances. Known as the “Eco Index,” this software tool works by posing a series of questions to companies on their environmental and labor practices, including some questions directed towards the companies’ suppliers. The software then assigns a score that represents a percentage of a perfect score. The goal of the Eco Index is to showcase competing items in retail settings with various “eco-value” scores so consumers can easily factor sustainability considerations into their purchase decisions. Firms like Timberland and Patagonia have publicly expressed their desire to move the conversation forward and gain consensus among similar companies so that an effective and meaningful eco index program can be implemented. With the heavy use of chemicals and crude oil to produce and ship these items, apparel production takes a heavy environmental toll that warrants accountability. While many consumers are increasingly motivated by sustainability concerns, it is often difficult for them to understand the environmental consequences involved in producing many of their favorite products. If companies begin to report the environmental impact to create their products, and consumers react by choosing certain items over others on environmental grounds, companies may become even more motivated to improve their sustainability efforts. For more information about the Eco Index, check out this article from The Wall Street Journal or this recently featured piece in Fast Company. My firm, Grossman Marketing Group, put together our 100 Tips for Marketing Success earlier this year to mark our 100th anniversary. Over the last century, we have learned a lot about what helps make our customers look good, so we thought we’d share what we’ve learned. 21 of the 100 tips involve sustainability, and over the next few months, I’ll be sharing these with you, by category. If you’d like to download the complete set of 100 tips, please click here. They are free! The four categories covered in the “green” section are 1) General Sustainability, 2) Green Promotional Products, 3) Green Design, 4) Green Printing. I’ll get started with the General Sustainability tips. Research shows that Americans want to work for, buy from, and donate to organizations that make significant and sustained efforts to address environmental issues. Sustainability can help you cut costs as well as build sales. We have experienced both at GMG and are happy to help you do the same at your organization. To learn more, just contact Ben Grossman at 617.591.2919 or bgrossman [at] grossmanmarketing [dot] com. Be transparent about green marketing claims—make sure they are verifiable by an independent, third party. Include your colleagues in your sustainability efforts; often the best ideas come from the bottom up, rather than from the top down! Spread the word about the sustainability efforts your organization is taking. Your customers, investors and colleagues care. Simple changes in your office can have a huge impact: use energy efficient light bulbs and put recycling bins at every desk. We encourage our colleagues to bring in old batteries, light bulbs and other household materials to be recycled for free. Employee education is key—sustainability must be part of the company culture. If so, it is much easier to implement (and less likely to be cut). Make sure to back up your green marketing efforts with truly sustainable business practices throughout your organization. I hope you find these helpful. We’ll be back to you later this summer with more! Many thanks for reading!